Aging is known to contribute to a multitude of systemic changes including those of the musculoskeletal system leading to decreased health, mobility and function. Most changes in well-being are exacerbated by inactivity. It has been scientifically documented that physical activity and exercise may slow or even reverse these deleterious effects thereby improving health, mobility and function. In particular, ligaments, tendons and joint capsules become stiffer with age as elastic fibers decrease and cross-links between collagen fibers increase. As connective tissue surrounding the joint changes, so too does the synovial fluid within the joint making movement more difficult. Not only do changes occur within the joint, they also occur in the muscles. The loss of muscle mass and strength also known as sarcopenia, increases with age. Then there is the fatty infiltration of muscle that comes with aging and lack of use. Recognizing the value of Bone Marrow Concentrate derived Stem Cells, Cytokines and Growth Factors in dealing with his arthritic hip when the alternative was a joint replacement, seven months ago, a 58-year-old man underwent a cellular orthopedic intervention. Over the past many months, the patient committed himself to a minimum of 30 minutes a day, five days a week at moderate intensity aerobic exercise alternating with three days a week at vigorous intensity. In addition, he partook in resistance exercise a minimum of two days a week at a moderate high intensity focusing on 10 exercises at each session targeting most major muscle groups, with 10 to 15 repetitions for each exercise performed thus adding an additional 20 to 30 minutes to the commitment. Then there are the benefits of his additional flexibility and stretching. When this individual came to me at his first visit, his stated goals were to return to a high level of recreational enjoyment with a particular interest in ball room dancing. As of last week, he had reached those goals but he has no intention of failing to comply with his exercise prescription. The obvious message of my Blog is to let you know I am unable to reach a desired goal without your commitment. 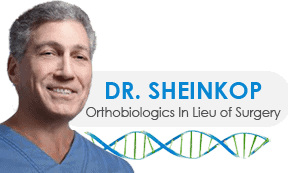 I may introduce Stem Cells, Cytokines and Growth Factors into an arthritic joint but to reach your desired goal or delay or perhaps avoid a joint replacement, those many changes that occur with aging can be slowed and even reversed by a combination of cellular orthopedics and exercise.